Anyway, they had a mention in last month’s issue’s editorial that covered both Brock Yates (his recent firing from Car and Driver) and the Going To The Sun Rally. I wrote a letter to them mentioning Mr. Yates and my experiences with him, and the fact that we’re attending the GTTSR too. They printed it – along with a photo of my car, from my diary of the Mille Autunno two years ago. Always cool to see your name in “print”. Kudos to Steve Mielnicki (MINI driver) for turning me onto Winding Road in April ’05! 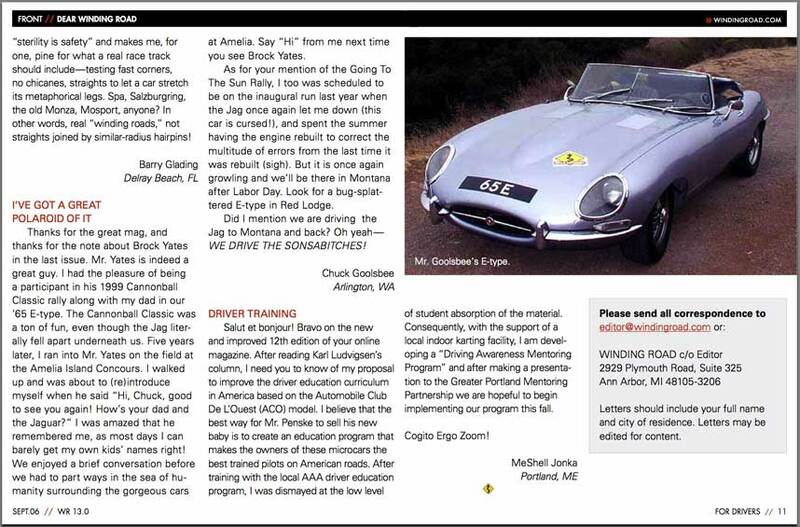 way to go Chuck – too many things to read and I’m behind in my Winding Roads! It was a pleasure to run your photo. Thanks for your comment about Winding Road. I’ve bookmarked your site so I look forward to hearing more about your automotive adventures. Welcome aboard Reilly! Thanks for joining us. If I can get ‘Net access this week, I’ll be updating the site nightly from the road. Should be a blast.